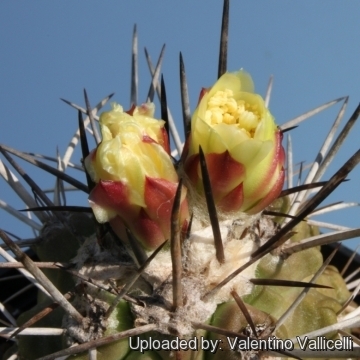 Blooming habit at Huasco in coastal Atacama desert of northern Chile. The distinguishing characteristic of this species is a prominent chin-like protuberance below the areole, more pronounced than in any other species of Copiapoa. 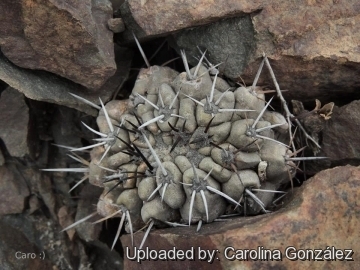 Origin and Habitat: Copiapoa fiedleriana is endemic to Chile, where it occurs in Atacama, around Huasco to north of Carrizal Bajo. Extent of occurrence of approximately 800 km2. C. fiedleriana was originally described from the sea shore at Huasco, near the mouth of the valley in which Nicolasa is situated. Altitude range: It grows at elevations of 0 to 600 m asl. Habitat and Ecology: The species grows not along the coast but in dry coastal hills (lomas costeras) overlooking the lower reaches of the Huasco valley, where it forms clumps of dark-bodied, spherical heads. 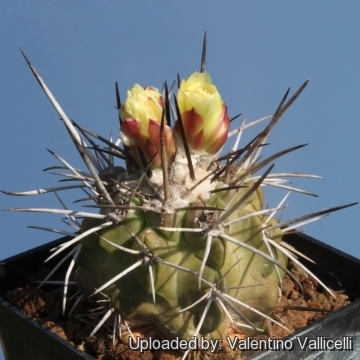 The area is rich in other cactus species with Eriosyce villosa, Eriosyce napina, Eulycbnia acida and Echinopsis coquimbana growing in association. The species is overall decreasing even if locally abundant (there are several hundreds of individuals), and there is a continuing decline of habitat quality and the number of mature individuals due to the effect of off-road vehicles, urbanization and industry in the species range. 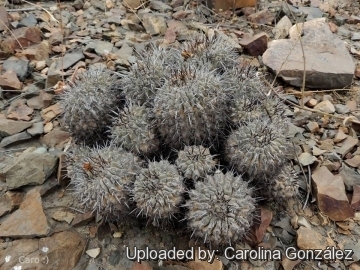 Copiapoa coquimbana var. fiedleriana (K.Schum.) A.E.Hoffm. Copiapoa pepiniana var. fiedleriana (K.Schum.) Backeb. Copiapoa megarhiza var. echinata (F.Ritter) A.E.Hoffm. Copiapoa intermedia F.Ritter ex Backeb. 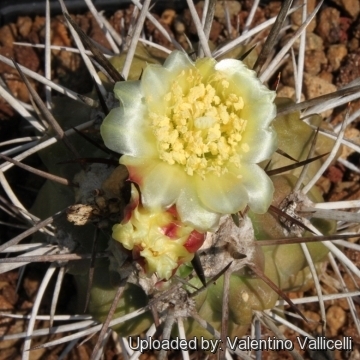 Description: Copiapoa fiedleriana, first described by Schumann as Echinocactus fiedlerianus in 1903, was included in Copiapoa by Backeberg in 1935 and then reduced to a variety of Copiapoa coquimbana by Hoffmann in 1989. 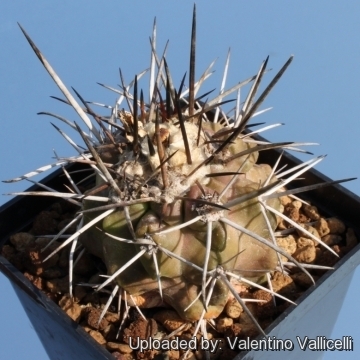 It is a strongly spined solitary to many-stemmed grey succulent of unusual form which you could describe as intermediate between Copiapoa coquimbana and Copiapoa megarhiza var. echinata, which occurs further north. The distinguishing characteristic of this species is a prominent protuberance below the areole, more pronounced than in any other species of Copiapoa. Typical plants from Huasco usually lack central spines, but it is quite variable and plants with or without central spines are found close to each other even in the some pupulation. 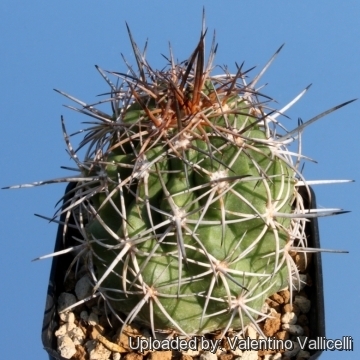 Derivation of specific name: The specific epithet honors the German master carpenter and cactus lover Rudolf Fiedler from Berlin. Stems: Globose, not elongated, grey-green to brown, 5-8 cm tall and in diameter. Cespitose from the base, forming dense cushions. Ribs: 15-20, straight, deeply crenate, laterally compressed, conspicuously tuberculate below the areoles. Areoles: Round to oval 4-7 mm long, grey, 20 mm apart. Spines: Blackish or brown, greyish with age. Central spines: Usually absent (if present usually 1 to 4 porrect and stiff similar in size and colour to the radials). Radial spines: 4-8, needle-like, rigid, straight to slightly curved, 8-30 mm long. Flowers: Yellow, 2.5-3 cm long. Inner tepals lemon-yellow, outer tepals with a red central stripe on the tip. Fruits: Globose 10-15 mm in diameter, greenish with few long reddish scales. Seeds: c. 1.5 mm long. Taxonomy note. Copiapoa fiedleriana is possibly the same plant as Echinocactus cupreatus Poselger ex Hildmann (1885), which was based on a cultivated plant of unknown origin, but interestingly the description made reference to protuberances, so this, together with body colour, suggests that it might that it might have been this plant. Copiapoa echinata F.Ritter: ( = fiedleriana) Plant noticeable for its strongly tuberculate ribs and pruinose epidermis, the large tap-root suggest it is related with Copiapoa megarhiza. Copiapoa echinata var. borealis F.Ritter: ( = fiedleriana) Plants from the northern areal. Copiapoa echinata var. pulla F.Ritter: ( = fiedleriana) Distingushed for the brown coloured epidermis. 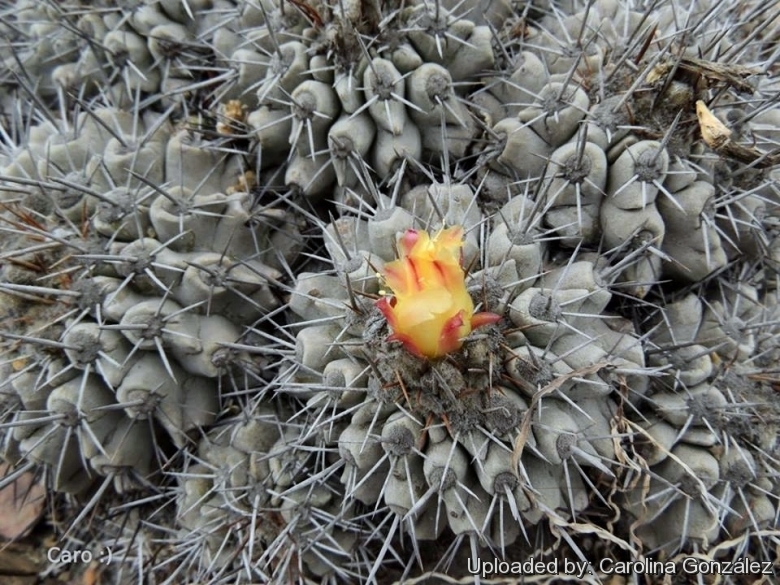 Copiapoa fiedleriana (K.Schum.) Backeb. in Backeb. & F.M.Knuth: Plants solitary or branched with large, fleshy roots. Stems globose, gray-green 5-8 cm tallwith tuberculate ribs. It has 4-8 radial spines blackish or greyish-brown up to 3 cm long. Central spines usually absent. 2) Faundez, L., Guerrero, P., Walter, H.E. & Saldivia, P. 2013. 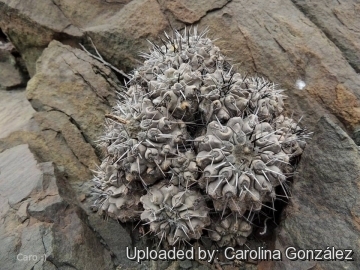 Copiapoa fiedleriana. The IUCN Red List of Threatened Species 2013: e.T152115A598694. http://dx.doi.org/10.2305/IUCN.UK.2013-1.RLTS.T152115A598694.en. Downloaded on 19 February 2016. Cultivation and Propagation: This species need full sun otherwise the bodies tended to elongate in cultivation, but should be protected from excessive heat and sun in summer, Require light watering, good drainage, and deep pot to accommodate tap root. Keep warm and dry in winter to avoid rot. Frost tolerance 0°C.